Packed with vitamins A and C – and hands-down the easiest winter squash to prepare – delicata squash is a fave around here! And it’s so delicious roasted; here’s how to make it happen. 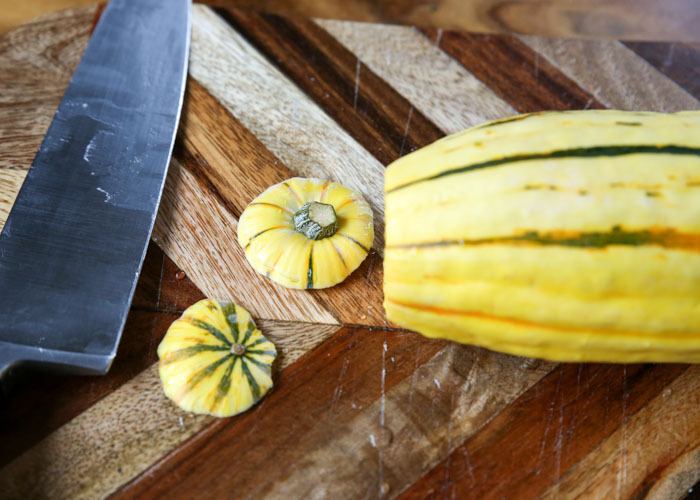 Delicata squash is the easiest winter squash out there. Why? Well, it’s small, relatively easy to cut, and – with its ultra-tender skin – you don’t even have to peel it! 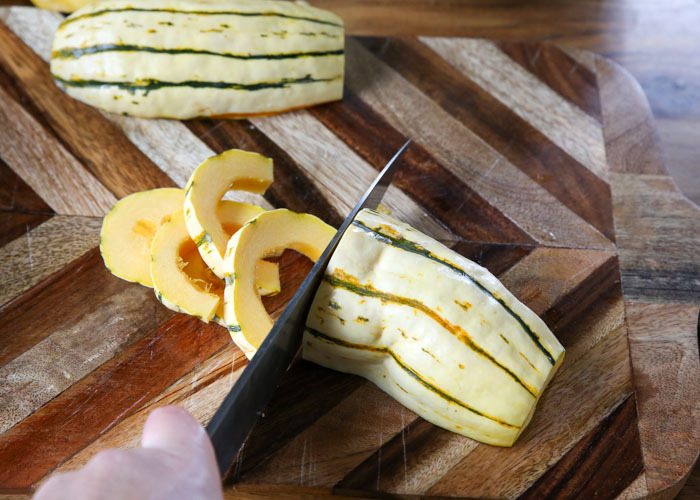 Yep, cook delicata squash and enjoy it skin-on. It’s also packed with vitamin A and is also a great source of vitamin C. So that’s cool. 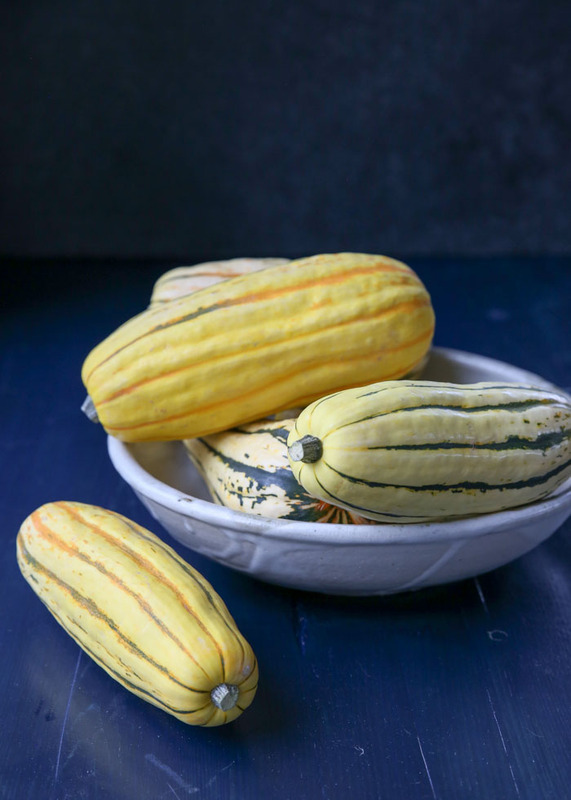 I have loved a lot of squashes in my life, but delicata is right up there toward the top. I even grew some of these cucumber-size squash in my vegetable garden this year! Okay, so I was only able to grow three of them in my tiny winter squash bed, but darn if those weren’t the best delicata squash I’ve ever tasted! I have big delicata squash growing plans next year. Big. 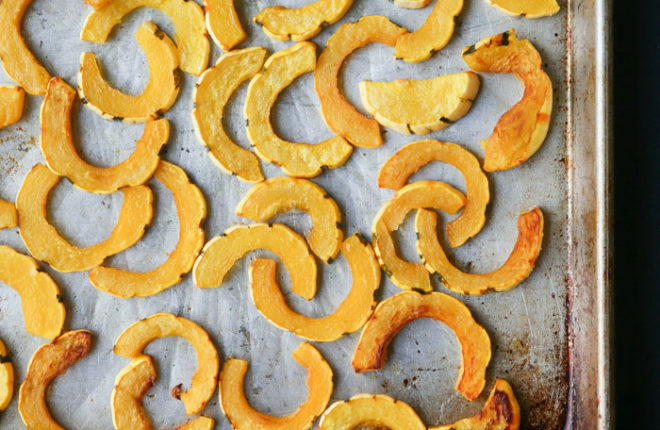 So if you’re wondering how to roast delicata squash, look no further! Read on for the detailed explanation, or scroll on down to the recipe for the quick & dirty. 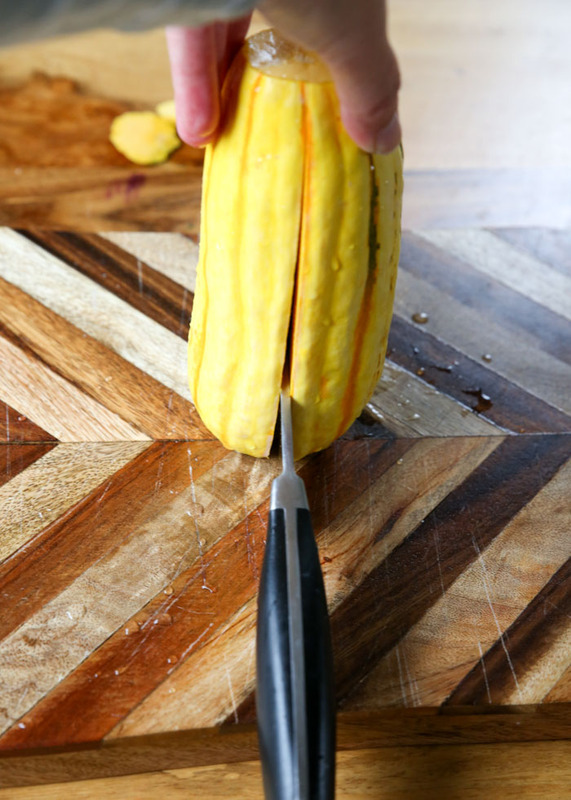 Selecting good delicata squash is pretty straightforward. Choose squash that’s mostly yellow with green stripes and/or teetering toward orange. But if the squash is all green, it’s not quite ripe yet. Make sure it’s firm and heavy for its size. 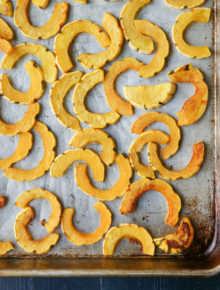 I like to choose delicata squash that are uniform in size so that they’re easier to cut into even pieces for roasting. 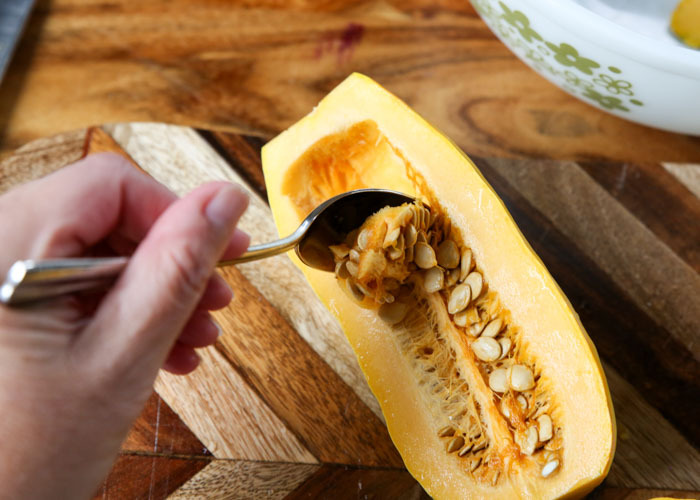 If you’ve ever attacked a butternut squash or gone at a spaghetti squash, you’re going to love how easy this is! Seriously, just lop off each end then cut it lengthwise down the middle. Then scoop out the seeds with a spoon. And then slice each half into 1/4-inch pieces. Throw your sliced delicata squash into a bowl and drizzle with olive oil. Sprinkle with salt and a bit of pepper if you like, and toss to coat well. 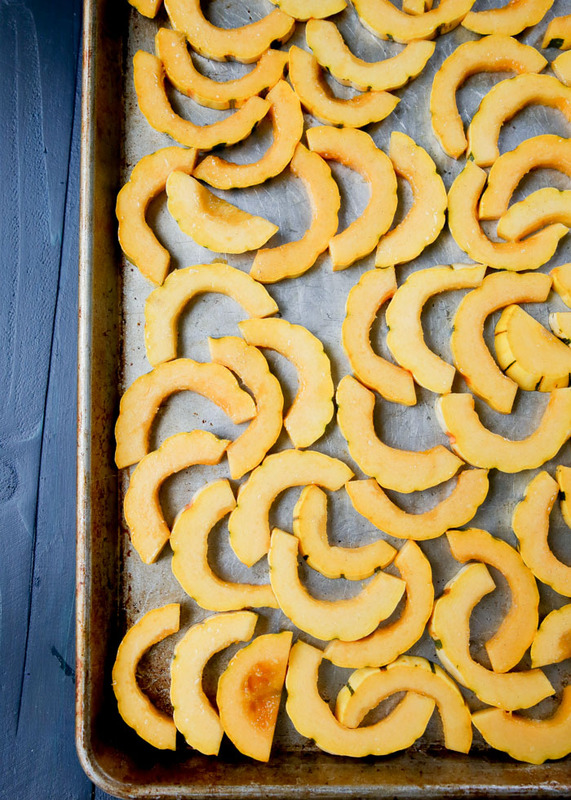 Then simply spread your squash onto a rimmed baking sheet, in a single layer. Bake at 400 degrees Fahrenheit for about 40 minutes, turning once about halfway through baking. 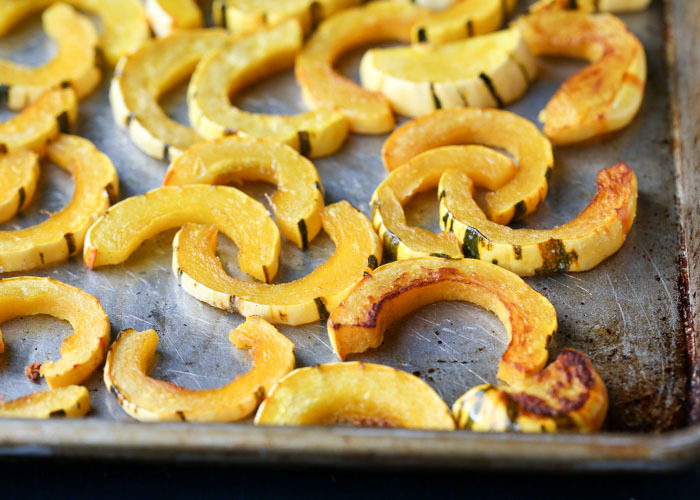 Once they’re tender and golden brown around the edges, your delicata squash is done! Enjoy however you like – in salads, on pizza, or straight off the pan! Place prepped delicata squash in a bowl. Drizzle with olive oil. Toss with hands or a wooden spoon until all pieces have been coated. Sprinkle on salt and pepper. Toss again to distribute. Spread on a large rimmed baking sheet in a single layer. Bake at 400 degrees Fahrenheit for about 40 minutes, turning once about halfway through baking. Once they’re tender and golden brown around the edges, they’re done. Store in a sealed container in the refrigerator for up to 4 days. Freezes well, too!